spSlab (formerly pcaSlab/ADOSS) is highly efficient and widely used for analysis, design and investigation of reinforced concrete floor systems. 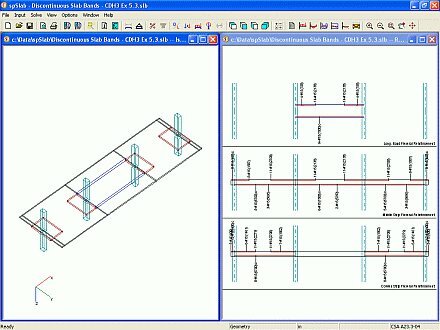 spSlab analyzes beams, one-way slab systems (including standard and wide module joist systems), and two-way slab systems (including waffle and slab bands). With capacity to integrate up to 20 spans and two cantilevers of multiple floor system types in each model, the capabilities of spSlab are not limited to new designs. spSlab can perform strength investigation for evaluation and/or modifications of existing building slabs. 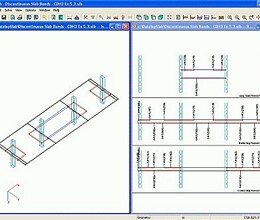 This program is sure to save engineers time crosschecking designs with applicable design code provisions. Save in both material and labor using the moment redistribution feature. It allows up to 20% reduction of negative moments over supports reducing reinforcement congestions in these areas. spSlab also incorporates torsion into shear design and investigation of beam systems. Shear capacity including torsion is represented in terms of required and provided area of transverse and longitudinal reinforcement. * spSlab download link provides trial version of the software. spBeam (formerly pcaBeam) is highly efficient and widely used for analysis, design, and investigation of beams and one-way slabs in reinforced concrete floor systems. spColumn is widely used for design of shear walls, bridge piers as well as typical framing elements in buildings and structures. spMats is highly efficient and widely used for analysis, design and investigation of commercial building foundations and industrial mats and slabs on grade. ShortCol computes ultimate strength of reinforced concrete column subjected to combined axial force and bending moment. Advance Design is a complete integrated analysis / design software dedicated to engineers. spSlab has been rated 5.0 out of 5 points. A total of 2 votes cast and 0 users reviewed the software.